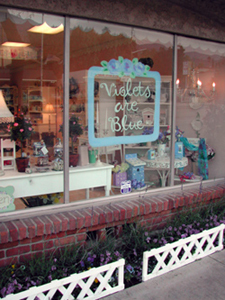 Violets are Blue was first born in 1985. I was 8 and my Mom was working hard at her day job and creating wreaths, birth announcements and other adornments as a hobby and little side business by night. I was often fascinated by the lustrous glue gun but learned early on not to touch. We used to do a lot of crafting together… and it left a huge impression on me, I adored it! About 15 years later I picked up the crafting torch and was concocting glycerin soaps and other bath goodies in my Mom’s kitchen. I then got the bug to do craft fairs and boutiques. My Mom made floral arrangements and cards, I had my soaps and we then rounded out our little diverse booths with hand-painted furniture and jewelry. We loaded and unloaded our little temporary spaces all over Southern California… From Big Bear to Seal Beach to Northridge and Ventura (and everywhere in-between)… phew… it was exhausting! 2007… four years… our 5th holiday season… wow. From enormous piles of cardboard, to broken windows to our very first run-in with counterfeit traveler’s checks… it’s not all fun and games… but it’s worth it! 2008… With much soul searching, I decided it was time to close our doors in La Crescenta and move onto another chapter in my life. I’m leaving the possibility open that we will open another shop someday… but where and when haven’t been decided yet. It’s bittersweet… but I’m hoping as this door closes, maybe another one will open. 2015… I wandered into a fun store in Raleigh to buy a table and ended up signing a lease! Back into retail, visual merchandising and all the fun things that I guess I missed! 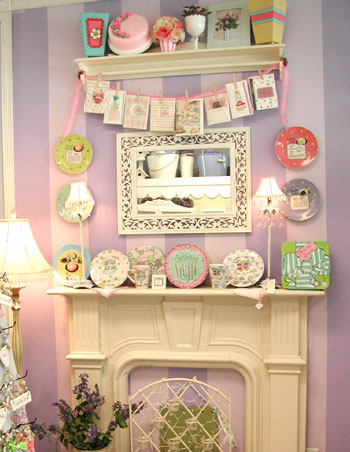 If you are in the Raleigh, NC area, visit Violet Cottage inside Inspirations Home Decor & More, 8601 Glenwood Ave.